Serves 4. Preparation time 5 minutes. Cooking time 20 minutes. • Melt the butter in a pot and sweat the onion, garlic and cumin seeds over a low heat until soft - don't let them brown. The longer it takes the better. • Add the rest of the ingredients, but set half of the chicken aside. • Bring the soup to a boil, then simmer with the lid on for 10 minutes or until the cauliflower is cooked. Take care not to overcook it. Liquidise and add water if you prefer a thin soup. Season to taste. You can also add a dash of lemon juice (optional). 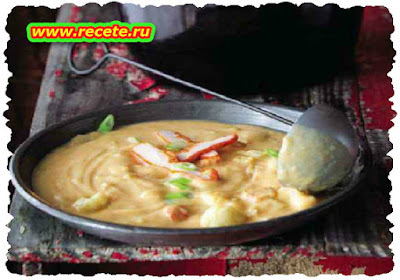 • Serve the soup with strips of smoked chicken.